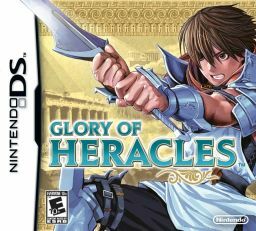 For some reason I am having a hard time hating Glory of Heracles, an RPG for the DS, even though it is giving me numerous reasons why I should. The game looks ugly, the game systems are bland, standard JRPG fare and every other part of it is obtuse and unintuitive. Yet somehow, I am managing to eke a modicum of enjoyment out of it, though I am having trouble pinpointing just why that is. Glory of Heracles is a special kind of hideous. It is ugly despite looking exactly how it is intended to, like a ghoulish Wind Waker. Much like the DS Fire Emblem, it uses what appear to be 3D models shaded to look like 2D sprites, which results in nicely animated monstrosities that manage to have all of the drawbacks of both 3D and 2D but almost none of the strengths. It is evident that a lot of care and effort went into making the game look exactly as it does, though I can’t imagine why. Even the DS Dragon Quest games, with their tiny sprites on top of PS1 quality 3D backgrounds look leagues better than this. Speaking of Dragon Quest, if you’ve played any entry in that series then you are about 85% of the way to mastering Glory of Heracles’ battle system. Dragon Quest gets something of a pass for being very vanilla in its battle system because it was first and it generally does something else interesting, like a job system or monster recruiting. Glory of Heracles, though, does nothing interesting. Its only deviations from the generic are tedious. It puts the enemies in rows, but the only purpose for this appears to be to make random battles last twice as long, with the back row inaccessible to attacks until the front row is defeated. There is also some sort of field element system, but it has affected me exactly one time in 15 hours of play, so I’m not exactly sure how it works. Overall, the battle system is a blander, emptier version of Dragon Quest’s. Then there are the simple things like exploring towns, which the game also manages to muck up. Take opening doors, for instance. When you walk up to a door, you push the ‘A’ button to open it. Not just run into to it, like most games, or push a button to enter. You push a button to open the door, but it doesn’t take you through it. There has yet to be an instance where I would want to open a door, but not to enter it. It is a small thing, but that extra step of tedium is indicative of my entire experience with this game. Despite its demonstrable ineptitude, I am somewhat enjoying Glory of Heracles. I have a history of enjoying mediocre (Magical Starsign) or even terrible (The Legend of Dragoon) RPGs, but right now I have a backlog of supposedly very good DS RPGs to play, like Radiant Historia and SMT Strange Journey, that I should be playing instead. But I keep coming back to this piece. The story is bland and the Greek setting is squandered. I guess I keep playing because in a lot of ways Glory of Heracles reminds me of second tier 16-bit RPGs that I never got to play. It has that same sort of copycat with a touch or originality that those games seemed to have. Maybe this is my way of showing myself that I do not need to play Lufia or Breath of Fire. Or maybe I should, I doubt they are worse than this.